Preview a visual timeline showing what makes the Teamsters so great! 1899: George Innis was President of the Team Drivers International Union. He continued in a leadership role with the formation of the International Brotherhood of Teamsters. 1902 :Teamsters National Union is formed. They split from the Team Drivers over owner operator issues. Many of these members are located in Chicago. 1902: Albert Young was President of the Teamsters National Union. 1903: Sam Gompers, the founder of the AFL, convinces the two groups to reconcile. 1903: The two groups meet in Niagara Falls and agree to merge, forming the International Brotherhood of Teamsters. Cornelius Shea is General President and E L Turley is General Secretary Treasurer. 1903: The charter for the newly formed International Brotherhood of Teamsters. 1905: Teamster Convention held in Philadelphia. Note black and white workers are together. 1905: In the days before motorized lift gates and pallet jacks, it took two Teamsters to move beer barrels off of the beer wagon. 1905: Sympathy strikers join 4,600 Chicago Teamsters on strike against Montgomery Ward. The strike goes badly and 21 members are killed. The rising discontent of the members after the strike leads to calls for new national leadership. 1906: Thomas Hughes a 31 year-old founding member of Local 705 in Chicago is elected as the General Secretary Treasurer for the union. 1906: Members from Local 85 start the tradition of Teamsters as “first responders through their efforts of rescue and clean up after the massive earthquake hits the city. 1906: Bakery drivers were among the first groups organized by the Teamsters in an effort to expand membership. 1906: Newspaper delivery workers navigating the streets of New York City faced many challenges. 1907: Teamsters organize workers at the wagon maker and blacksmith shop that evolved into Fruehauf Trailer Company. 1907: Daniel Tobin, a 32 year-old rising leader in Boston, is elected as the union’s General President. He will serve in that role for 45 years. 1908: The Early Teamster – A Teamster from Green Transfer Company in Portland, Oregon stands proudly in front of his horse and carriage. 1909: Name of union is changed to International Brotherhood of Teamsters, Chauffeurs, Stablemen and Helpers of America to reflect the expanding membership. 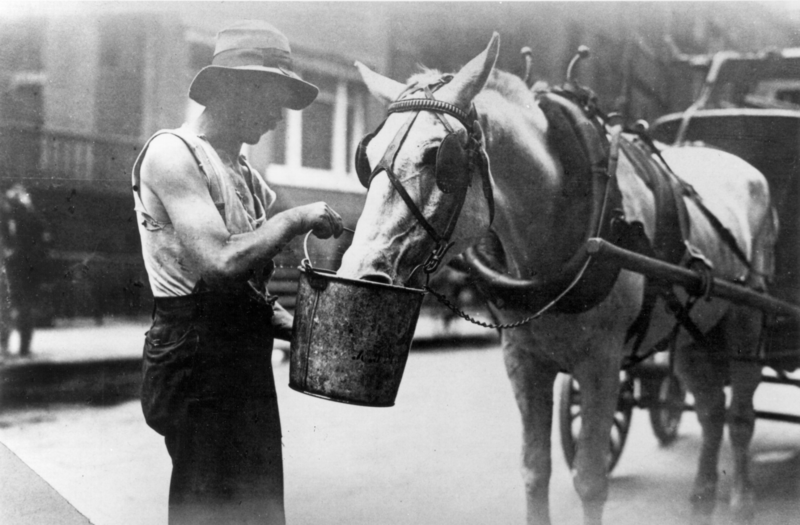 1910: This Teamster is feeding his horse during the rush of a busy day. Early Teamsters bargained for a noontime feeding of their horses. The horse team has to be kept in good shape so the Teamster could earn a paycheck. 1910: Many lumbermen in the Northwest and Upper Michigan are Teamster members. 1912: Five Teamster members complete the first transcontinental delivery by motor truck. It takes them 90 days to travel from Philadelphia to San Francisco. 1912: An early motor truck and a horse and wage used by Adams Express Company represent the transition many companies made as technology evolved. 1912: Varied toll rates reflect the growing changes in transportation. 1913—Teamsters are some of the first workers to be trained to drive and fix motor trucks when companies where they are employed, such as American Express begin to use the new vehicles. 1914: The Teamsters Union is becoming an integral part of the community on many levels. 1916—United Parcel Service founder James Casey asks the Teamsters to organize his workers. 1916: Canadian National Express horse-drawn wagons and drivers in Winnipeg. 1916: William Lee, a driver for the Ward Baking Co. with his horse and wagon in 1916. 1917: William Lee again, now serving as a driver for the Ward Baking Co. with the first motor truck the company owned. Lee later served as President of Local 734. 1917: The number of women entering the workforce increased greatly with the onset of World War I. They took on many jobs traditionally held by men, such as maintaining vehicles and machinery. Women workers with the first four wheel drive vehicle which was produced in Wisconsin. 1917: Dan Tobin travels to Europe to study war production efforts on behalf of Woodrow Wilson. He is pictured with John Gillespie, first International organizer and later the General Secretary Treasurer for the union. 1918: Samuel Gompers, President of the AFL, pays the doughboys in World War I visit. 1918: Tobacco delivery times were shorted with the advent of the motorized truck. 1918: Boston Teamsters secure an electric operator onto a flatbed truck to help produce electricity. Connie Bowen Machinery Mover was one of the first Teamster rigging companies in Boston. 1919: Fleet of D.W. Dunn Co. Packers & Movers, Boston. Teamsters had members at many of the major moving companies over the years. 1919: Canada is hit with many strikes after World War I. The strike in Winnipeg is a major labor event. 1920: Teamsters formally join forces with the Canadian Labour Congress. 1920: Van drivers on the picket line during the strike in New York City. 1921: General Secretary-Treasurer Tom Hughes involved the Teamsters in all kinds of community service and charity work, laying a foundation that lasts to this day. Hughes holds an orphan at an annual picnic for the Children’s Home in Indianapolis. 1922: Teamsters win a major jurisdictional dispute with dockworkers. All goods loaded on and off trucks are handled by Teamsters. 1928: Teamsters affiliate with Building Trades workers. 1928: Joint Council 26 in Cincinnati, Ohio celebrates the union’s 25th Anniversary. 1929: A large number of Teamster women were employed by the laundry industry before World War II. Women members iron clothes at a large laundry company. 1931: The bleak economic outlook during the depression years left even skilled workers vulnerable to pay cuts and layoffs. 1934: The Teamsters strike in Minneapolis, known as “labor’s turning point”, involved more than 10,000 workers and lead directly to the enactment of pro-labor legislation such as the National Labor Relations Act. 1938: The Truckers Strike in New York City was one of many, like the Minneapolis Strike, that brought attention to the low wages and poor working conditions of the 1930s. 1939: “Car hauling” was a growing industry that provided the Teamsters with many new members. : Early carhauler in South Bend, Indiana, Local 364. 1941: Teamsters enlist in the armed services together all across the country following the attack on Pearl Harbor. 1942: Teamsters aid in promoting strike talks and the idea of “no strikes for the duration” of the war. Thomas Flynn, Local 364 and International staff member talks with Albert Taylor of Local 135. 1942: Teamsters are part of the civil defense team in their local communities. 1943: Teamsters raise more than $2.3 million in victory bonds by 1943. 1943: Teamsters help build and run the “Red Ball Express” supply line through France. 1944: Tobin and FDR have a close relationship. Tobin took on many assignments during the war years for FDR. 1944: The Teamsters were very supportive of Franklin Roosevelt through all of his Presidential campaigns. FDR spoke at the 1940 and 1944 Teamster Conventions. 1944—Women take on all manner of Teamster jobs in large numbers. Pictured are Bakery drivers from Massachusetts. 1945: Teamsters members who are returning veterans are guaranteed their seniority status. They are the only union to do this at the time. 1948: The campaign to organize Macy’s employees was overwhelming successful. The vote was 98% yes to join Teamsters Local 804. 1951: Teamsters continue their service to the community after the war. 1952: In food processing, a National Conference of Fruit, Vegetable and Produce Industries was formed to cover employees in canneries and the new frozen food packing companies. 1952—Dan Tobin’s last Convention, held in Los Angeles, is televised in prime time for four nights on NBC. 1953: Art Drawbert, a member of Local 439 in Stockton, California, was a logging driver for the Winton Lumber Company. 1953: The Teamsters move their headquarters from Indianapolis to Washington D.C.
1954: The area of food processing had grown considerably by the 1950s. Here, Local 471 workers complete the packaging of Land O’Lakes butter. 1955: The new Teamsters building was dedicated in November 1955. 1955: A Teamster woman demonstrates agility and balance as she harvests mushrooms grown in an abandoned mine. 1955: Teamsters play an essential role in the nation-wide delivery of the new polio vaccine. 1956: Teamsters are monitoring all the stages in the bottling process at the Pepsi-Cola plant in Baltimore, Maryland. 1957: The International Union Convention in 1957. James R. Hoffa is elected. 1957: Ben Turner, a black steward from Atlanta, was featured as a role model for other stewards around the country in the December Teamster magazine. 1959: Members of Washington, D.C. Local 639 demonstrate their support for the Teamsters as employees of the first union shop card station in the city. 1959: Teamsters begin organizing in the Airline industry with groups such as the Los Angeles Airways helicopter pilots. 1959: General President James R. Hoffa tests a new Be-Mac truck in St. Louis. 1959: Hoffa establishes DRIVE as the union’s political action group to battle the ever-increasing anti-labor atmosphere on Capital Hill and the business world. 1960: The Teamsters affiliated with the New Jersey Poultry Farmers Union 530 in 1960. More than 500 farming families became part of the Teamsters at that time. Poultry farmer gathers eggs in Vineland, New Jersey. 1961: Teamsters are known as “Knights of the Highway during the 1950s and 1960s for always helping motorists. 1962: More than 15,000 women come to Washington D.C. between1962 and 1968 to lobby for labor-related issues through the DRIVE groups. Politicians like LBJ consider them to be the best political action group around. 1963: Members of Local 810 joined fellow Teamsters from around the country at the civil rights March on Washington. 1964: The historic National Master Freight Agreement is signed, covering 450,000 members and 16,000 freight companies. 1965: Mrs. Ted Owens of Local 291 looks out from behind the wheel of her 15 ton dump truck. She learned to balance work and family in a unique way. 1965: General President James R. Hoffa with Dr. Martin Luther King, Jr.
1965: A Teamster steward talks with members on the job in Washington D.C.
1965: Members of Joint Council 16 in New York were on hand as Joe Konowe of Local 210 presents checks totaling $3,500 to Dr. Wyatt Walker, Regional Director for Dr. King’s Southern Christian Leadership Conference. The money went to help marchers in Selma, Alabama. 1965: Viola Liuzzo, the wife of Local 247 Business Agent Anthony Liuzzo was murdered while helping transport marchers with Martin Luther King Jr. from Selma to Montgomery, Alabama. 1965: In attendance at the funeral of Viola Liuzzo were Dr. Martin Luther King Jr., Teamster Vice President Harold Gibbons, General President James R. Hoffa and Teamster leader Joseph Konowe. NAACP Leader Roy Wilkins, UAW President Walter Reuther and Civil Rights leader James Farmer are in the front row. 1966: James R. Hoffa gets acquainted with Cystic Fibrosis poster child Joanna Everett as part of the Teamster campaign to fight the disease. 1966: Three Blythe Motor Company workers walk the picket line in Sanford, Florida. Wages were so far below standard that Teamsters local and Joint Councils adopted striking families, giving them a $75 a week for essentials and some health care. 1967: The vending machine industry experienced major growth during the 50s and 60s, and added thousands of members to the Teamsters Union..
1968: In the 1960s, Teamsters membership expanded to include companies such as National Car Rental. National employees in Detroit were pleased with their first contract signed in 1968. 1968—Clara Day, Business Agent and Community Services Director for Local 743 in Chicago became one of the most prominent women in the union. Day greets Civil Rights leader Ralph Abernathy. 1968: Teamsters organize Pan Am workers at JFK airport. Pan Am and Braniff were major organizing campaigns in the 1960s. 1970: Teamsters expand membership with the ever growing United Parcel Service. 1973: Teamsters also expand membership in the area of public service workers. 1973: San Diego Zoo Wild Animal Park employees, all Teamsters, tend their charges. Teamsters cover occupations from A to Z Airlines to Zoo Keepers. 1979: Motion picture Teamsters on the set. Teamsters have had members in the movie and theatrical industries for many decades. 1979: The Teamsters and UPS sign the first National Master United Parcel Agreement. 1980s: Maria Brandon of Local 786 in Elmhurst, Illinois stands by the heavy duty equipment she works with every day. 1997: Teamsters at UPS electrified the nation and provided a shot in the arm to the entire labor movement with their victorious strike. 1999: Teamsters are re-invigorated in the 1990s with the election of James P. Hoffa. 1999: President Bill Clinton honors General President Hoffa at a dinner in New York. 2000: Canadian Teamsters stand on the front lines in the fight for public safety. 2000: Casino parking attendants select Teamsters representation in Detroit. 2001: Local 85 Teamsters celebrate an organizing victory during the San Francisco airport campaign. 2001: General President James P. Hoffa and fellow Teamsters survey the damage at the site of the World Trade Center disaster. 2001: Local 890 Teamsters celebrate their victory at Basic Vegetable Products, ending a two-year strike. 2002: UPS workers rally in solidarity to achieve a strong, $10 billion contract. 2003: Freight Teamsters ratified the 2003 National Master Freight Agreement with a record 86% of the membership voting yes. 2003: General President James P. Hoffa and UNITE President Bruce Raynor kick off a joint organizing campaign. 2003: The Brotherhood of Locomotive Engineers vote overwhelmingly to merge with the Teamsters. 2004: The Brotherhood of Maintenance of Way Employes merges with the Teamsters. 2005: Graphics Communications International Union merged with the Teamsters. August 2005: Teamsters are first responders in helping victims of Hurricane Katrina. Teamsters from across the country send supplies and volunteers. August 2005: Teamsters answer the call to aid victims of Hurricane Katrina. February 2006: Teamsters stop Bush administration deal sell port management businesses in U.S. seaports to a foreign-owned corporation, which would have weakened American security. November 2007:UPS Teamsters ratify contract early, before financial crisis upends business in U.S.